The reviews on books can be frustrating at times. You put so much money, effort, and energy into creating a great reading experience and then anyone can come along and say “this sucked.” In the world of Amazon and book blogs and the Internet in general, every single person has an opinion and they’re ready to share it. As is their right. You shared your perspective by writing the book and now it is their turn to share theirs. Let’s take Love In Touch as an example. I went over the manuscript and suggested changes, Lucy worked on those changes and sent it back. I hired an editor to go over the manuscript, Lucy worked on those changes and sent it back. I hired a proofreader to go over the manuscript and those changes were made. I went over it again. At this point I’m pretty confident that we’re in great shape and the typos and grammar mistakes have been caught and corrected. And it being an Amazon review, there’s not really any opportunity to respond to this criticism. I am unable to find the errors she is talking about and no other reviewers say this. I leave a comment on the review to ask for examples but she doesn’t respond. So what can you do about criticism? A bad review might sometimes clue you in to something you could be doing better with your books, but I’ve found that that’s rare. Usually it is one person’s opinion and it says more about them that it does about you or your book (or your author’s book). And every person is allowed to feel however they want to about your book. It’s out there in the world making its own friends and enemies. It’s not in your control anymore. If you don’t want anyone to say bad things about it, don’t publish it. Because tastes vary and there’s definitely going to be people who don’t like your book. There’s nothing you can do about that. Focus on the people who did like it! The most frustrating part is that that bad review, that opinion, is now connected to your book and other potential readers are seeing it. It’s dragging down your overall rating. But still there’s not much you can do about it. It always, always, always looks bad if you respond to a review. No matter how politely you try to approach it, you’ll always look like the big bad guy trying to silence the underdog reviewer (and more than just look it, that will pretty much be exactly what you are). You’re likely to come across as insecure and desperate which is also not a good look. The best thing to do is to completely ignore it. Assuming the review is just hateful and an attack on you rather than the book, treat it like your annoying little brother who will get bored and wander away if he can’t bait you. Not to mention if you don’t grace the person with a response, then they’re left looking shrill and alone. If the review is focused on the book, then it’s not a bad review. It is doing what it’s supposed to do. No matter how much you might disagree with it, negative reviews have an important purpose and it has nothing to do with you. Trust them to read the review and know whether or not it applies to their enjoyment of the book. If it’s just a personal attack, new potential readers will just roll their eyes and buy the book anyway. If it brings up things in the book that the reviewer didn’t like, then maybe the potential new reader knows they dislike the same things and then they don’t buy it which saves you from a second bad review! When I’m trying to decide if I’ll buy a book, I start by reading the lowest reviews. I’ll see if the things that bothered those reviewers are things that would bother me. Often they are not and then I feel confident in trusting the higher rating reviews. I admit that the accusation of typos is a particularly difficult one to deal with. Numerous typos in books is something that I find difficult to deal with so if I see a review claiming a book has them, I might avoid that book (although I usually read the sample chapter, the “look inside” to see for myself). That’s why for the Love In Touch situation, I attempted to get in touch with the reviewer. What she is claiming is simply not true. If you’re a reader and a book buyer (which if you’re here, I would assume you are!) please don’t take reviews at face value. Every review is written by a person with his or her own biases and assumptions. There are cases where reviewers will claim there are typos in a book in order to sell the author on their own editing services! Always check out the sample yourself before you believe a reviewer who claims there are typos. If you’re an author, I highly suggest never reading your reviews. Tough perhaps, but you’ll be saner for it and better able to focus on creating your next masterpiece. I suggest having an email address for your writing that you share on social media. The emails from readers will give you a much clearer picture of your work. They are highly motivated and not someone who is just going to dash off the first things that come to their mind. They had to put some effort in to find your contact info. There’s nothing more special than getting an email or a letter from a fan telling you how much they loved your work. And when someone reaches out to criticize through email, it is much more often stated in constructive ways. Respect and value the book bloggers even when they don’t like your book. They are serving readers and not you. Just step away and let that process do what it’s meant to do. And go write another book. Strive to make it better than your last. But know that you’ll never write the perfect book that every person on the planet will adore. Check out the reviews for classic books. It’ll make you feel in good company. 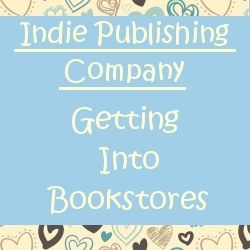 The holy grail of starting a book publishing company: getting your books onto bookstore shelves. I’ve focused most of my efforts on ebooks and print-on-demand Internet orders for physical books. It’s a great model since it has such low overhead cost. It’s a pretty new model too, with ebooks taking off in popularity only in the last four years or so. But I have my eye on getting my authors’ books onto bookstore shelves. The biggest thing holding me back is the nature of returns. Basically, books go to bookstores on a consignment basis. The books sit on the shelves and if they don’t sell, they get returned to you for a refund. You shipped out a bunch of books, got paid for them (at the steep discount that bookstores get) and then months and months later all that money has to be refunded! It can be a nightmare for a small business’s cash flow. So you can’t count on any of the bookstore money until there are actual sales. Okay, once I’ve got some money saved up so cash flow isn’t an issue, what is the process to actually get books into bookstores? Createspace and Lightning Source both use Ingram as a distributor which means that working with them your books will show up as available for bookstores to order. The only trouble is, they set the terms not you. And they tend to set terms that aren’t attractive to bookstores. If you want bookstores to stock you, you’ve got to be willing to accept returns and give them a significant discount so they can maintain their profit margins. I had a friend who works at a bookstore look up our books in her system and they are marked as unreturnable. That means the store is not going to take a chance on them. Lightening Source may claim that with a fee you can make your books returnable, but my friend said in practice they are still effectively unreturnable. The reason why? Because it is literally “print on demand” they don’t have a warehouse for returned books. The book is created when someone buys it so there is no inventory sitting around. I’m told that you may be able to tell bookstores that they can buy through Ingram but return directly to you. I’m going to try that out before I start looking for a non-POD printer, but that is probably in the future for this company. It seems like the best way for a small press to start getting into bookstores is through the local route. Get to know the book sellers in your area. Go in and talk to them. If you are the author or you are nearby the author, present your books as local. A lot of bookstores have a special section to highlight local authors. Just ask if you can do a test run of books on their shelves. If they stock just five or ten copies, that’s a start! Once those books are on the shelf, make sure they sell. Tell your friends and family, ask for help. The most important thing for bookstores is that the books sell. No matter how small the first run is, if it sells out than they will be interested in getting more copies in. Ask if you can do a test run on a consignment basis where the bookstores don’t pay for your books up front but they pay you back a percentage on sales. (Here is a list of examples of different bookstores and the terms they offer for self-published authors [which are going to be at least very similar to the terms for small presses particularly if they’re using POD technology]: http://www.mediabistro.com/galleycat/how-to-sell-your-self-published-book-into-bookstores_b51732 Note how important it is to be up to date on industry pricing). But … if your self-published POD book is not picked up by Barnes & Noble corporate (the dream, as it saves plenty of time), you can still get it in the stores. How? By calling the stores individually, or hiring a salesperson to work on commission. This is what I do. Though several hundred Barnes & Noble stores still need to be called (ugh! ), the book has been ordered by nearly 100% of the stores individually contacted. Here’s the spiel. First, you give them the book’s title or ISBN number. Then, as the bookstore staff person is looking it up in the computer, say, “Though it is POD, it is through Ingram and fully returnable with regular terms.” If you do that, nine times out of ten Barnes & Noble will at the very least “short order” the title, that is, order two or three to see how it goes, before they place a larger order. This is assuming, of course, that you can sell the virtues of your title. Just, check and make sure that it is fully returnable and if not, remember to say it can be returned to you directly. Ask your local bookstores if you can do an book signing at their location and offer to supply the books yourself. Bookstores like events that will draw people in and if your book is selling well, they may consider stocking it. Make sure that you get lots of people to your signing. Again, call in any favors you’ve got! If you bring the bookstore traffic, they will be interested in working with you. You can also create demand for the book before it is on shelves. Ask your fans to request them. If a bookstore doesn’t have the book, it can be special ordered for a customer. Tell your fans to ask at the customer service desk. Enough demand and the buyer at the store may want to stock it. Up next for me are to look into getting a non POD printer and hiring my own distributor. I plan to make some connections to help me do that when I go to Book Expo America next May! I’m super excited to have a booth at the trade show. This will allow me to present my books to bookstore buyers, library buyers, big chain buyers, as well as distributors. It’s expensive to attend but it has fantastic potential to grow my business. Later on we’ll talk about booth set up because it’s important for both trade shows and bookstore signings! One of the nice things about doing ebook first is that I have a sales record to show buyers and reps. I have books that have shown their market potential already. That’s a big benefit! As the publisher, you’re going to be thinking about sales and proving your book’s sales potential. That’s a big part of the job or a publisher.